The movie version is directed by Andrew Dominik, who adapted George V. Higgins‘s bestselling novel Cogan’s Trade (1974), and stars Brad Pitt, Scoot McNairy, Ben Mendelsohn, Ray Liotta, Richard Jenkins, James Gandolfini, Vincent Curatola, Max Casella, and Sam Shepard. George V. Higgins was the author of more than 20 novels, including the bestsellers The Friends of Eddie Coyle, Cogan’s Trade, The Rat on Fire, and The Digger’s Game. He was a reporter for the Providence Journal and the Associated Press before obtaining a law degree from Boston College Law School in 1967. He was an assistant attorney general and then an assistant United States attorney in Boston from 1969 to 1973. He later taught creative writing at Boston University. He died in 1999. 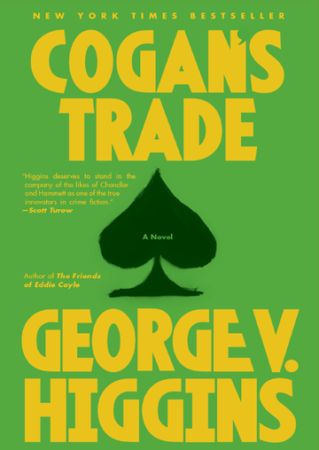 Vintage reissued Cogan’s Trade (Knopf, 1974) along with the tie-in edition and ten other novels by George V. Higgins, coordingating with the release of Killing Them Softly. In Britain, Orion reissued Cogan and six other Higgins titles, in electronic and/or paperback format(s). Foreign publishers around the world have reissued Cogan: Chinese (simplified: Shanghai Translation; complex: Big Apple); French (Lafon), German (Verlag Antje Kunstmann), Hungarian (Cartaphilus), Italian (Einaudi), Japanese (Hayakawa), Korean (Screenseller), Polish (C&amp;T), Russian (Azbooka), Serbian (Laguna), Spanish (Asteroide), and Bulgarian (Locus). Audible.com issued a newly recorded unabridged audio version of Cogan and relicensed 8 other Higgins titles on its backlist (available on iTunes, Audible/Amazon, etc.). The movie of The Friends of Eddie Coyle was reissued on DVD by Criterion in 2009. Read/hear appreciations on WBUR and the Boston Globe.